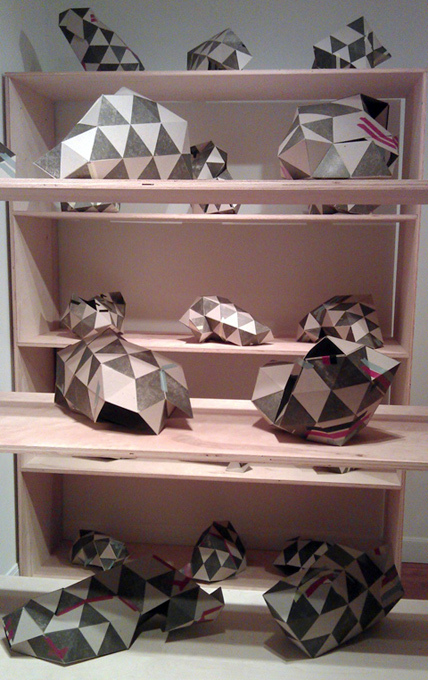 I recently made my way over to Lawndale Art Center to take in the latest round of shows. I had read the review of Anne J. Regan's contribution to Prospectors, which deemed it "a music nerd's dream exhibit", so I wanted to see that. 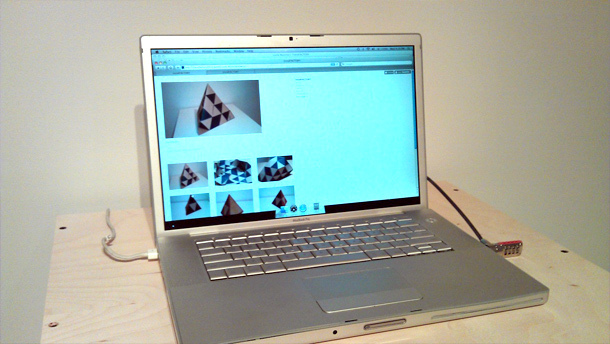 There was also an exhibition involving Twitter, which I myself have used in my own art practices. That piece, by Travis McCarra & Michael Gonzales titled #everyoneisanartist, looked promising, with a bank of large flatscreens anchored to the wall with CPUs below them. Viewers (from anywhere in Texas) are encouraged to tweet some text or an image and tag it with #everyoneisanartist. The content of these tweets is then displayed on these monitors. One big draw back for me, however, was that they wanted you to have Twitter's location functionality turned on to be able to map the tweet. I don't use this feature and had no way to easily activate it on my phone, but I sent some test tweets in nonetheless. Nothing on the screens changed, and I became frustrated by not being able to have an immediate impact on the system presented by the artists. Having made my way through the main and mezzanine galleries, I headed up to the third floor to check out the Project Space. The last piece exhibited there was Randall McCabe's Scroll, which I wrote loving about here. With high hopes for something interesting, Leslie Mutchler delivered the goods with trendFACTORY. While I'm not sure how the room worked on opening night with a crowd, it was great to walk in as the only visitor. I had somehow managed to not pick up the information materials outside the door, but a quick survey of the room got me excited. 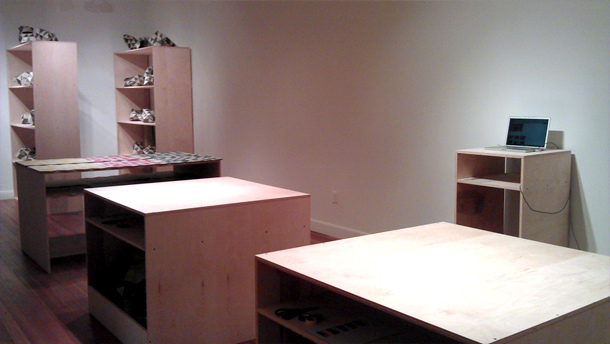 There were two large, cleared surfaces in the middle of the room; an empty podium against one wall and a second podium holding a laptop against another; there was a larger table with shallow stacks of colored board; and finally there were two shelving units filled with small geometric sculptures. At this point I couldn't help but break into a smile. We were being invited to build something. Truth be told, I would have probably reacted differently had I walked into that space a week earlier. But two things over the past few days made for a more serendipitous introduction to TrendFACTORY. One: I began an unplanned and surprising studio practice involving found objects and duct tape. No fancy supplies or facilities needed; just an object, tape, and scissors. The activity put forth here by Mutchler would have to be similar given a gallery's constraints (no training necessary, no big tools, easy cleanup required, etc.). Two: a former student of mine recently posted a brief animation he made of triangular polygons folding in on themselves. It was clear in the Project Space that the structures we were being asked to build were based on a similar system found commonly in 3-D modeling. Given those two things, I was pretty excited by what I had found in the space. I woke the laptop up to find a Tumblr dedicated to the project on screen. There were thumbnails of previous visitors creations, which clued me on on the purpose of the empty pedestal to my right. It was the photo station. On a shelf beneath the computer was as a laminated sheet of instructions for building your object. I happily went to work. There were three colors of screened board to choose from. 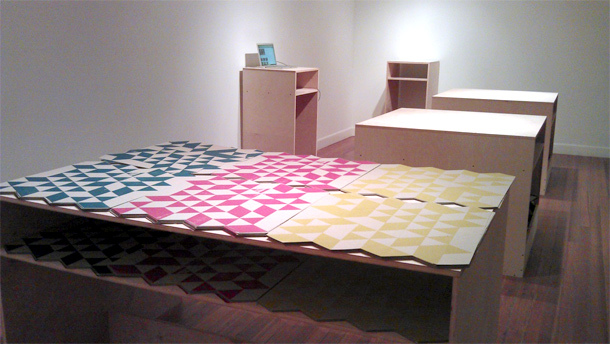 Although the examples on the shelves were all in gray, The table presented options of cyan, magenta, and yellow. (I would have told you blue, red, and yellow, but Mutchler specified these colors in her checklist. Those colors, along with black, form the primary colors of the CMYK color model found in printing. Here, though, Mutchler has kept them separate. As a color geek, I'm curious to her selection of these very specific hues.) 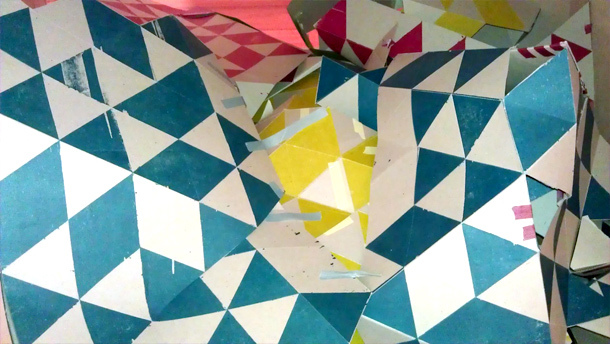 I selected a cyan piece of board and made some folds and some cuts, and then began taping folds together. I must confess to misunderstanding the first set of directions on folding, which are much more clearly defined in the accompanying instructional video that I missed until I returned home. Perhaps my object would have been more complex had I made every fold possible from the scored substrate before building a form. As it was, I hastily made a crude pyramid, with a curious opening in one corner. I was more was eager to participate in the online component, particularly since the Twitter piece downstairs left me unfulfilled. 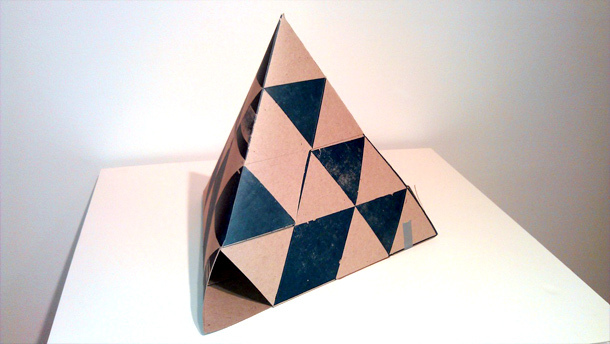 So I placed my pyramid on the photo stand, snapped a pic, and emailed it to the address provided. Having completed the task, I unfolded my object and placed it under the work table to join the other used pieces of board. I put my scissors and tape away and then refreshed the Tumblr page on the laptop. I then began to compare mine with the forms that had been created by previous visitors. I could have done better, I thought, and vowed to return to build again. It was pretty fun, after all. In her statement, Mutchler speaks of creating a "commonality through shared physical experiences." TrendFACTORY does that beautifully. No matter your age, professional background, or self-assessed creativity level, we all can fold, cut, and tape. The end result may be different for each user, but the process is very much the same. I encourage you all to visit Lawndale and go upstairs to the third floor. Build yourself an object. Take a picture with your phone and email it to the TrendFACTORY Tumblr if you'd like. Then take your object apart and put the chipboard underneath the workspace so others can build from it. Let's share an experience. Much enjoyment with this Lawndale visit. Thanx.